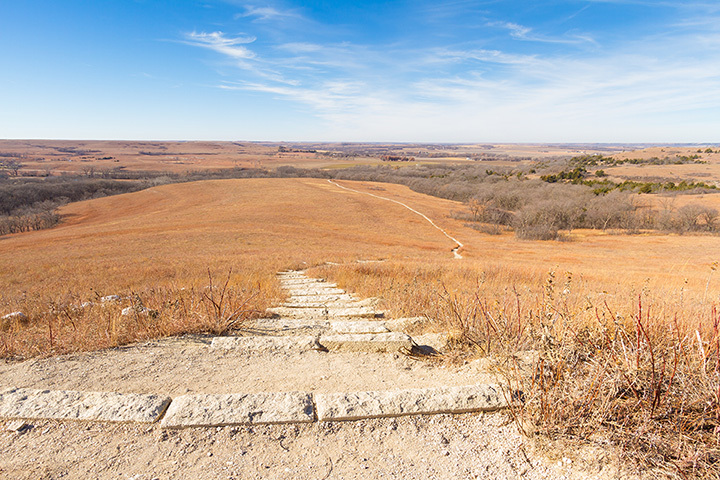 Kansas is home to hiking trails offering an abundance of wildlife, whispering prairie grass, and breathtaking, vast sky views that are unmatched. To really become one with the wilderness, all while taking in the nature Kansas has to offer, be sure to check out these 15 excellent hiking trails. This 18-mile, primarily flat, dirt, hiking trail is for the easy to moderate hiker. Limestone posts help mark the original trail and interpretive signs explain its history. Motorized vehicles are not permitted on this trail. The nearly 17-mile Indian Creek Bike and Hike Trail is paved and generally level with some steep grades. Non-motorized bicycles and dogs on a leash are welcome. The Great Bend area offers three hiking trail options, but be sure to take the paved, seven-mile, Hike and Pike Path, along Arkansas River. The Cheyenne Bottoms Wildlife Area and The Nature Conservancy Area gives walkers a way to get closer to the abundant nature and wildlife in the area. These moderate hiking trails are open every day, from dawn to dusk, and offer six miles of hiking trails—through low-land forests, over limestone ledges and across vistas of the breathtaking Flint Hills and the Kansas river valleys. Hikers encounter occasional steep climbs, uneven footing and narrow pathways. All hiking trails begin at the parking area and self-guided trail brochures are available. The 15-mile Elk River Hiking Trail is a great full day or two-day hike for the moderate hiker. Trailing along the northwest side of Elk City Lake, the trails offer panoramic views, limestone bluffs, narrow canyons, small streams and rock overhangs. Tall Grass features over 40 miles of hiking and nature trails that are open all day and night (for only those traveling on foot). Ranging from 3.8 to 13 miles, these trails are moderately challenging. Witness scenic views, wisps of prairie grass blowing in the wind, stunning wildflowers, and so much more. Be sure to enjoy views of the night sky, as well. A 6.5-mile scenic trail connects the cities of Humboldt and Iola, and is open every day from dusk to dawn for hiking, walking and bicycling. The paved trail is wheelchair accessible, and includes a beautiful historical bridge, abundant wildlife, and rich foliage. The Southwind Rail Trail is links to the 51-mile Prairie Spirit Trail in Iola, for an uninterrupted 58-mile route through southeast Kansas. The George Lathan Hiking Trail is a four-mile, lightly traveled, dirt trail that loops near Clinton Lake. A good trail for all skill levels. The trail wanders through forest, open fields and along the shoreline. Wildlife that frequent the trail area, include beavers, coyotes and white-tailed deer. Camping is also provided. Gary L. Haller National Recreation Trail is a 13.8-mile, point-to-point trail, and is suitable for all skill levels. The trail is primarily used for hiking, walking, running and road-bikes. Rolling hills and maintained wooden planked bridges offer a diverse trail for hikers and bicyclists. The Linear Trail is 3.8 miles and mildly trafficked. This point-to-point trail offers explorers excellent river views. The surface of this trail is composed of crushed limestone. Hikers are welcome year-round, of all skill levels. Mushroom Rock Trail is a 0.2-mile, lightly traveled loop trail, located on five acres. The small nature trail features several unique rock formations, some of which appear as large mushrooms. The largest rock mushroom formation measures about 25 feet in diameter. The trail is primarily used for hiking, walking, nature trips, and birding, and is accessible year-round. The Southeast Kansas Nature Center at Schermerhorn Park offers both wooded and grass trails, with trails leading to Schermerhorn Cave. The cave is home to grotto salamanders, dark-sided salamanders, cave salamanders, and the gray belly salamander. Rare species of mussels, the Neosho Mucket and Rabbitsfoot can be found near the Spring River areas. The park is open Monday thru Friday and closed on Sundays. Wilderness Park has almost five miles of trails that take hikers through wooded areas, natural grasslands, wetlands, and tributaries. Most of the trail system is handicap accessible, except for parts of the trail that leads to ridges formed by open pit mining. The winding 4.8-mile trail parallels the Republican River to near the entrance of Fort Riley. The trail is made of limestone and can be easily navigated by any skill level. This trail connects to the Old River Bluff trail and continues to the Milford State Park's Trail system, offering hikers 14 miles of continuous hiking trails. The 100-foot-tall limestone bluffs on the south side of Cedar Bluff Reservoir are said to be spectacular, especially around sunrise or sunset. Other than a gravel road, there is no maintained trails at the bluffs, but visitors are free to hike close to the cliffs. The bluffs overlook the 6,000-acre Cedar Bluff Reservoir. Certain permits are required year-round and are available from the park office or a self-serve station. View more Kansas Hiking Trails.